The Autumn equinox is tonight… days and nights are of equal length. If only it felt that way. The nights seem twice as long. And the season of long nights is just beginning. But that also means that the time of day Sandy and I loved most seems to come around sooner every day… twilight. Dusk…. when the sun has gone down and the light softens… everything gets quiet… the colors are muted, the edges softened. The world seems at peace. We would sit in the garden, drink red wine and watch the light change and fade. Sandy loved this time of day. And now I love it even more. I look forward to the twilight every day… wishing it could somehow be dusk all the time. It’s when I feel closest to Sandy, knowing she is right there next to me… watching the last sunlight on the mountains… listening to the river and the crickets. Though these nights are getting colder — our first frost was this morning — I still have a ritual of watching the twilight fade, lighting the candles in our garden, and lately building a campfire in the copper fire bowl, watching the stars and the cycle of the moon… wrapped in a wool blanket and playing my Native American flute for her. This nightly ritual grounds me, keeps me breathing. The daytime… when I’m at work, talking with people, going to the grocery store, all those “normal” things we do — it all seems surreal and distant and often meaningless. As if I’m just going through the motions, trying to function and survive until the evening time. And then everything seems more real… Sandy’s presence around me, my grief and loss, all the memories… the twilight and the long nights are at once comforting and painful. Prayers go out to my sister Megan. Bill died September 7 at 94. Peg is 89 and still going strong. We’re all gathered around the fire. A short note to let you know that our friends Mike and John, who have been cycling from Alaska to Argentina to raise money and awareness for brain tumor research, are just two days away from completing their 16,000 mile journey. (See blog days 13 and 14 in November for background of how Sandy and I met them). They are less than $1,500 short of their goal to raise $50,000 for the National Brain Tumor Foundation. 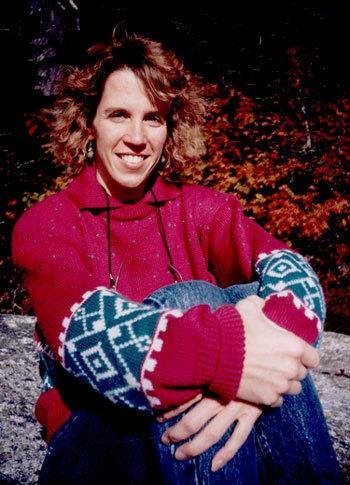 If you can donate a little in Sandy’s honor, you would be helping a great cause. 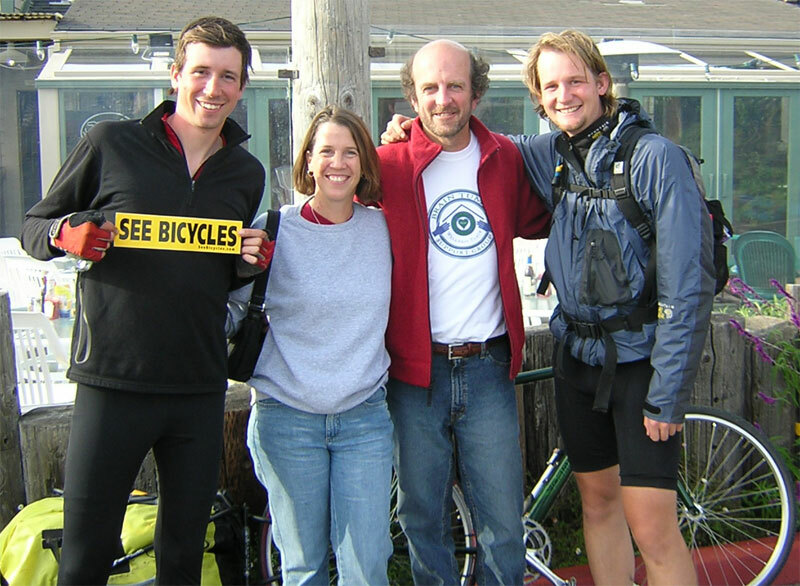 SEE PHOTO of us with John and Mike in November 2005, at Half Moon Bay on California coast. when I think of life without Sandy by my side. when I feel her presence all around me, helping me to put one foot in front of the other… and honor life and living. to have had 17 years with her, my best friend and soulmate. The perfect match. The woman of my dreams. Attempting to write anything now is so difficult. My thoughts and emotions tumble… the motivation ebbs. This was for her, not me. But Sandy wanted me to keep writing. And I want to keep writing. And so I will. We were working on a book idea which I will continue on with. I have been spending most of my time in our garden… watering and tending to it by day… lighting candles, watching the cycles of the moon, listening to the coyotes howl, sipping our favorite red wine and playing my Native American flute for her by night, often all night. It has been one month since she died, though time has no meaning for me any longer — minutes are hours, hours seem like days. And the nights are long, very long. Everything is slow motion. But friends and family come around for visits, I ride my bike with friends and of course take the dogs down to the river for swims on these hot days. And I have been working on some projects around the house that Sandy and I had wanted to do. I also started back to work part-time this week. But being away from the garden and our home is difficult. There is comfort here. And I feel Sandy here in everything I see or do… which is at once painful and comforting at the same time. But mostly comforting. She is still with me… and always will be. I guess now would be a good time to retell a couple of the messages from Sandy that I talked of at her gathering party…. Yellow balloons had played a significant role in our lives in the weeks before she died… there was the trip to the grocery store, three weeks before she died, to stock up for all the people coming to her wake — we wheel Sandy into the store in her wheeelchair and she says, “We have to decorate this damn wheelchair!” So we go to the flower section and buy 13 (her lucky number) yellow (LiveStrong color) balloons. So there we were with this gigantic bouquet of yellow balloons floating above her wheelchair while we shop. And then at the LiveStrong Challenge in Portland we ended up with some yellow balloons which we left at a friend’s house on the way home. And of course we had yellow balloons at her celebration. Three days after Sandy died her brother and his wife dragged me out for a hike on a trail near our home. I wanted to get to a large rock that Sandy loved to sit on. About halfway there, a mile or so up the trail, I look down and laying next to the trail is a yellow balloon, string still attached, and the balloon had popped into this amazing flower-like shape. That balloon is now on the little shrine of photos and favorite things of Sandy’s that I have next to our bed. So she’s out there, right here, watching out for me still. Though I’m sure she had to close her eyes when I was at the top of that ladder. I guess I’ll end with this for tonight. And I will keep writing, even if no one is out there reading it. I don’t want this blog journal to to become about my grief and sorrow and loss. I want it to continue to be about Sandy… with memories, thoughts and impressions of her. To honor what she was all about… living. So please join me in that sharing. The full moon is beckoning me back to the garden.